Phase plot made with data from ASAS-SN Database for period P = 0.428988 days and epoch HJD 2457994.2756. Credit: Barquin et al., 2018. Spanish astronomer Salvador Barquin has detected a new binary star system in the Draco constellation. The newly found system, registered by the discoverer in the International Variable Star Index (VSX), is an EW-type eclipsing binary. The finding is reported in a paper published May 16 on arXiv.org. EW-type eclipsing binaries (EWs) are W Ursae Majoris-type eclipsing variables with periods shorter than one day. They usually consist of two ellipsoidal dwarfs of spectral types F, G, or K that are in contact with each other, and share a common convective envelope lying between the inner and outer critical Roche-lobe surfaces. Although over 40,000 EWs are listed in the VSX catalog, astronomers are interested in finding new ones as the origin and evolution of such objects are still not fully understood. For instance, it is uncertain how eclipsing binaries of EW type form. Some studies suggests that third bodies may play an important role in the origin of EWs by removing angular momentum from the central binary through early dynamical interaction and later evolution. Recently, Barquin conducted a search for binary star systems by checking variability of chosen objects. For his search he selected an area within 200 arcseconds around one particular star in the Draco constellation known as TYC 3905-2030-1. By analyzing the available data regarding this region in ASAS-SN (All Sky Automated Survey for SuperNovae), Tycho-2 and UCAC4 (The fourth U.S. Naval Observatory CCD Astrograph Catalog) catalogs, he identified a new EW-type eclipsing binary. "It was discovered during a search for previously unreported eclipsing binary stars through the ASAS-SN database," Barquin wrote in the paper. The astronomer found that the star designated UCAC4 716-059522 (also known as GSC 03905-01870 and USNO-B1.0 1431- 0327922) is variable and is not reported in the VSX database. According to the paper, the object has a period of 0.43 days, amplitude of 0.34 when it comes to magnitude in the V-band, and primary minimum epoch HJD 2457994.2756. 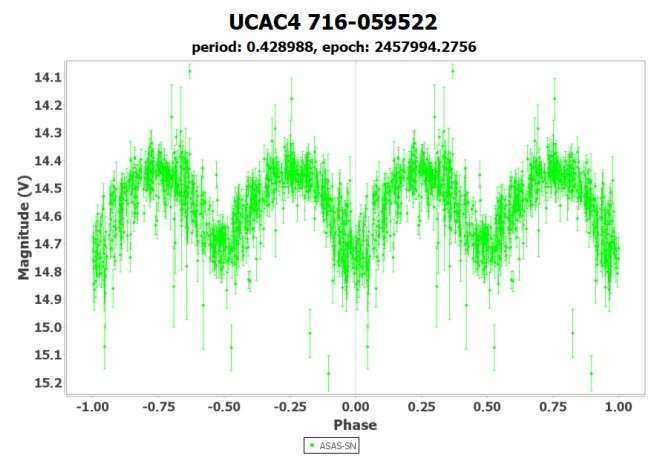 Barquin concluded that these values indicate that UCAC4 716-059522 is an EW-type eclipsing binary. "The shape of the light curve and its characteristics (period of 0.428988±0.000001 d, amplitude of 0.34±0.02 V Mag, primary minimum epoch HJD 2457994.2756±0.0002) indicates that the new variable star is an eclipsing binary of W Ursae Majoris type," the researcher wrote. Additionally, the author of the paper estimated the magnitudes of maximum (Max), primary minimum (Min I) and secondary minimum (Min II) of UCAC4 716-059522. These values are 14.43, 14.77 and 14.72 respectively. Barquin reported the newly found EW to VSX, providing all the necessary data including cross-identifications from existing catalogs. After its approval, UCAC4 716-059522 was assigned its AAVSO UID (American Association of Variable Star Observers Unique Identifier). Its identifier is 000-BMP-891. Discovery of a new binary star system (GSC 03905-01870 = USNO-B1.0 1431-0327922 = UCAC4 716-059522) in the Draco constellation is presented. It was discovered during a search for previously unreported eclipsing binary stars through the ASAS-SN database. The shape of the light curve and its characteristics (period of 0.428988±0.000001 d, amplitude of 0.34±0.02 V Mag, primary minimum epoch HJD 2457994.2756±0.0002) indicates that the new variable star is an eclipsing binary of W Ursae Majoris type. I registered this variable star in The International Variable Star Index (VSX), its AAVSO UID is 000-BMP-891. One may dicover dying stars by noting any deviation upon a steady state, Lambda,. using present data expect it to lengthen. Deveiation over space? How fast is it getting longer as a function of distance? Really? No plane indentfying all motion? What direction, ..? Infinite Space! Infinite set of charge pairs. As far as we know simply are. Mathematically always solvable with a set. But expect a stream of galaxies and light speed is the speed of a wavelet. Other words it's field, DC, is already there; for, you must be in the field to see any wrinkle. I guess the above four comments may make sense in one of the world's languages. However, English isn't one of them. Sorry, each wavelet defines and update to each equal potential sphere about the charge's center. Thus the field is updated, get it? It's also unique! The issue: it is continuous in time and space; therefore time and space can only be conceptual. We didn't figure on a set of diametrical spherical fields is all there is? Reality!